These are gorgeous, Andrea. We used to live in an old house that had large old peony bushes. I had so many that I even put them on vases on my porch! They're amazing. YOUR PEONY FLOWERS ARE JUST BEAUTIFUL. THANKS FOR SHARING. 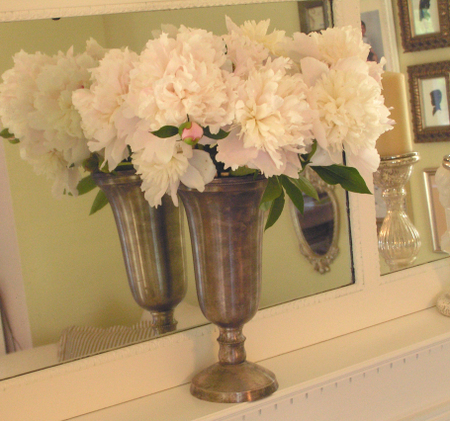 Your peonies are so perfectly beautiful they could pass for faux flowers. All that prettiness and they're scented too?...Amazing! Thank you for letting me admire them...they don't like the climate here in So. California. Your peonies are breathtakingly beautiful! They are the most showy, lucious flowers I know of. Your are truly blessed to have them. 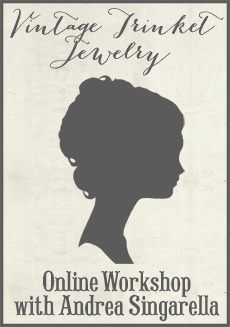 Hope you will stop by my blog and enter my Cottage Charm giveaway. what lovely peonies! I am still waiting on mine to bloom! I cannot wait! Oh- peonies are my FAV flowers! They were in my wedding bouquet and I just planted 7 plants around my house...can't wait for those gorgeous blooms. Question- how do you keep those pesky ants away?? So, so lovely! I bet your house smells heavenly:) Now I wish I had some peonies in my yard! Andrea they are so beautiful. Gorgeous photos! Peonies are my FAVOURITE flower and I have 2 bushes in my backyard-although they haven't bloomed yet cause it's still kind of cold here in Toronto.Have a great week! I love peonies~ They are very pretty smelling and make lovely arrangements!Mine are just getting ready to bloom! Oh, I just love your flowers!! They are sooo beautiful!! These look beautiful!I also have in my backyard but i can't decide to cut or not to cut. Mine are drooping my whole bush is this normal? I have never tried to grow them. 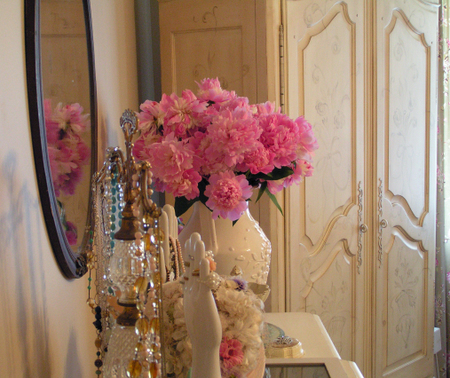 Thank you for sharing your lovely peonies with us! I am in peony paradise! This will definitely be a "must" for next year! 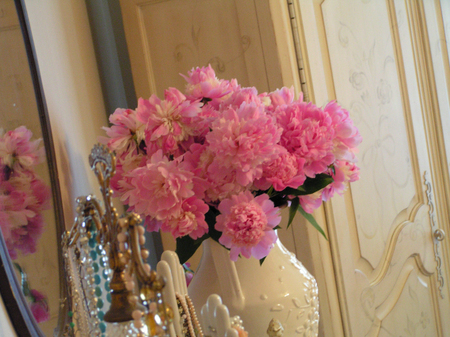 Peonies are one of my favorite, right up there with tulips, lilacs, lily-of-the-valley and lavender. Lucky for me, I get to enjoy yours and in a week or so, the ones here...they haven't bloomed yet in Wisconsin! But boy, the lilacs are putting on a great show! 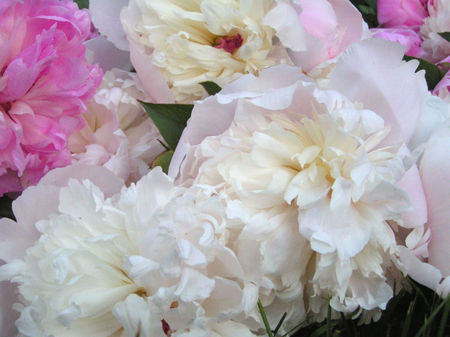 Aren't Peonies the greatest? I think they look like giant roses. 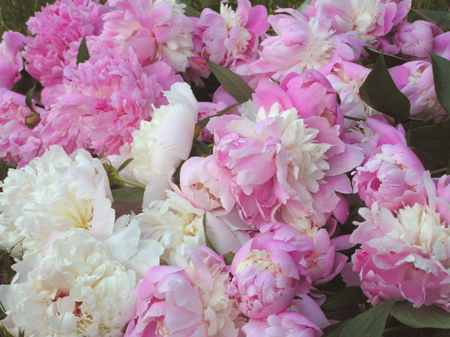 When we first got marriend my husband used to work for Klehm's Nursery, who specialty was growing peonies. (Their gift shop was called The Pink Peony.) Our neighbors had some Klehm Peonies planted in their yard from the 1950's and I was sick when I found out that the new owners dug them all out. I wish I had known they were doing that because I would have transplanted them in our yard. We have some Coral Charm peonies which start out a apricot color when they first bloom and turn a creamy white as they open. Thanks so much for sharing your beauties with us. P.S. The new sweet treats in your shop look very yummy! So beautiful! I found you just by chance tonight and enjoyed pausing here. My two peony plants are full of buds (in Oregon) and it looks like it's going to be a wonderful year for them. Can't wait.